Magical pink ceiling in Tokyo’s sky. Cherry blossoms in full bloom in Aoyama Cemetery, the oldest, most exclusive, public cemetery with a large foreign section. 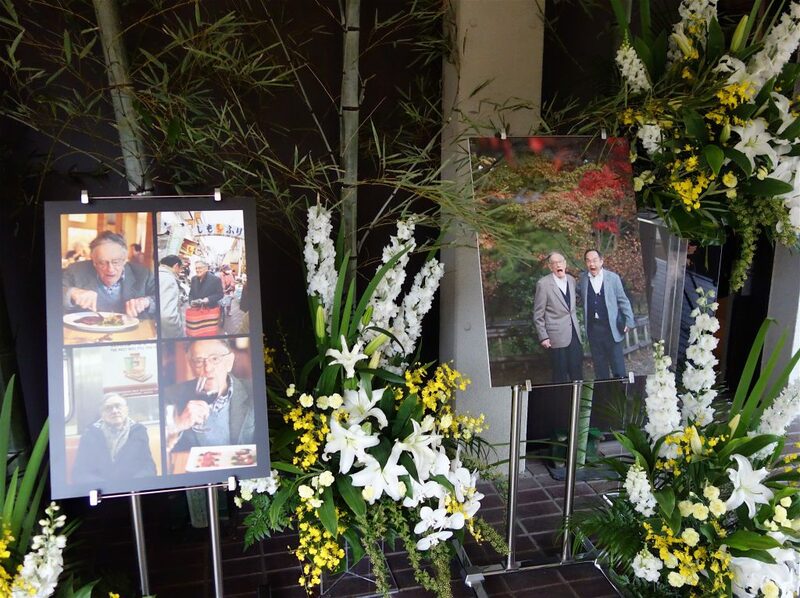 Today we said a final goodbye to famed literature expert Donald Keene at his public funeral, conducted in Buddhist-style 仏教, the social norm in Japan. 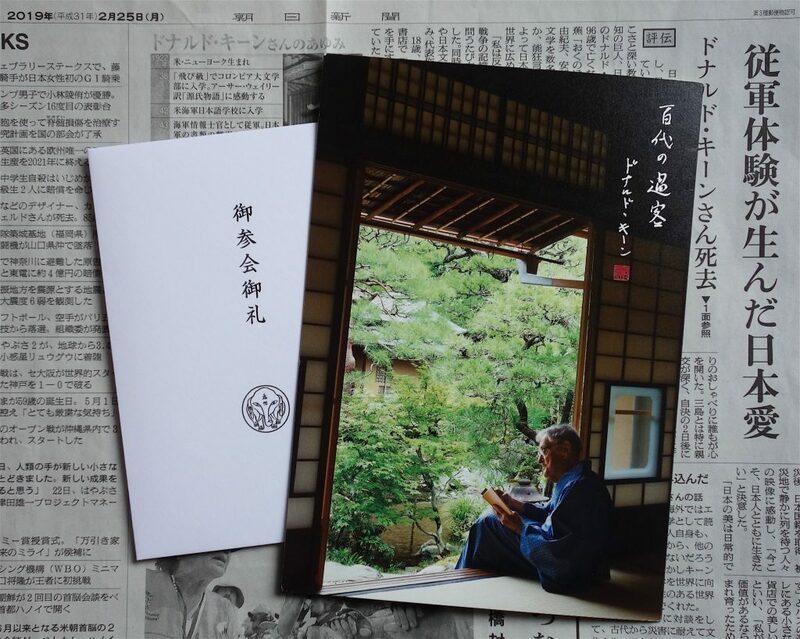 Directly under Keene’s photograph, in the center, – the envelope for condolence donation 祭粢料 (Saishiryo) by the Japanese Emperor (Tenno-heika) 天皇陛下 had been prominently exhibited. In this context I bowed in front of the ceremonial envelope of the Tenno 天皇, the highest authority of the SHINTO 神道 religion. 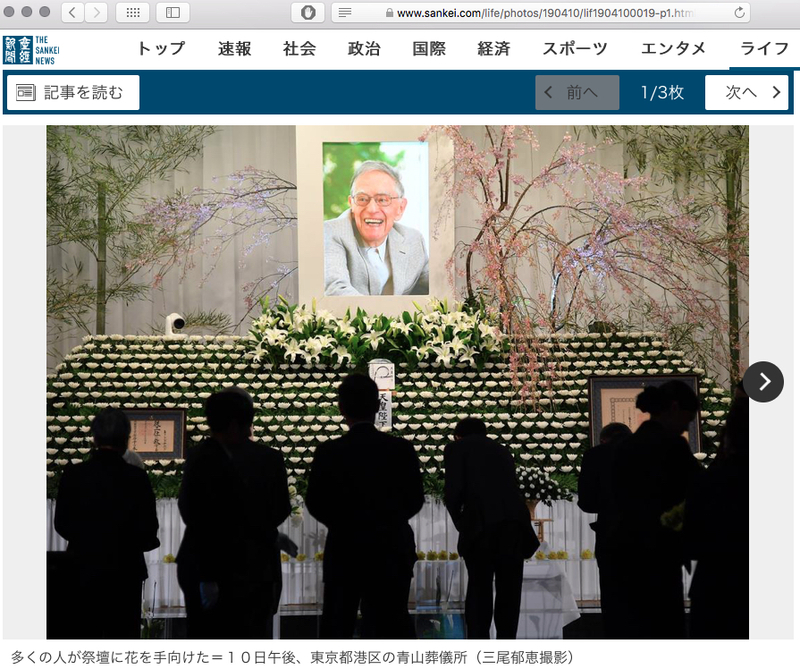 A strange feeling, as I wanted to bow in front of Donald Keene and not the Japanese Emperor. 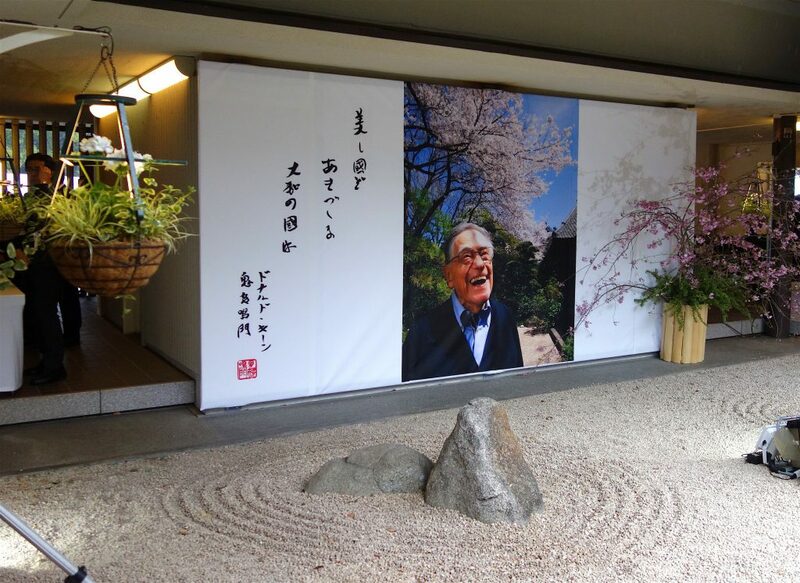 One important, crucial experience to understand the Tenno’s role in contemporary Japan. 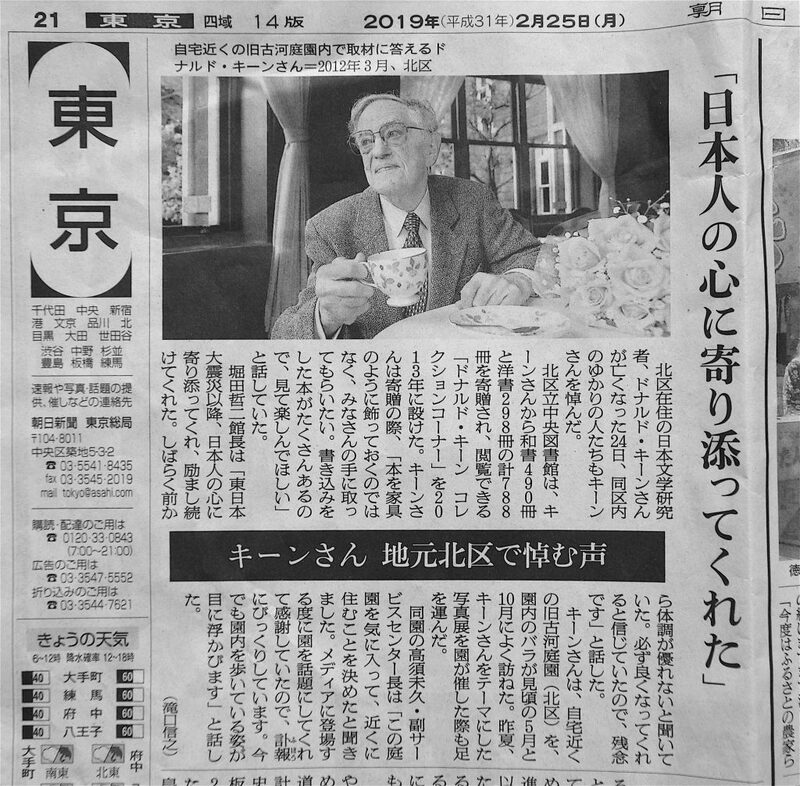 I had the opportunity in meeting highly respected Mr. Keene on several occasions, one was in 1990, during the International Book Fair in Frankfurt, where my anthology about Contemporary Japanese Literature (Momentaufnahmen moderner japanischer Literatur 現代日本文学, 34 novelists, from IBUSE Masuji 井伏鱒二 to YOSHIMOTO Banana 吉本ばなな) had been promoted by my German publisher. At that time I realized a kind of generational gap between Mr. Keene and me. He probably noticed, that my new book surpassed his work. 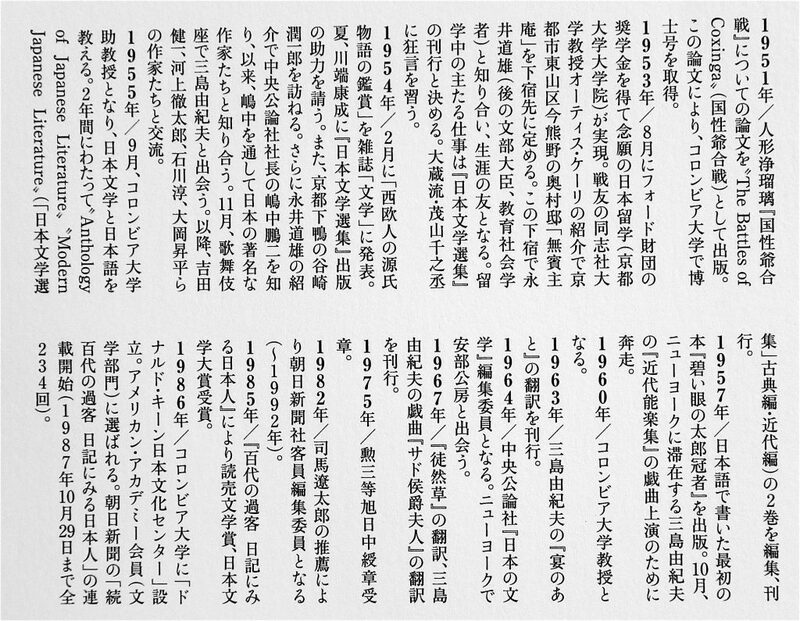 He never showed interest towards novelists like SATA Ineko 佐多稲子, NOMA Hiroshi 野間宏, NAKAGAMI Kenji 中上健次, TSUSHIMA Yuko 津島佑子, MURAKAMI Ryu 村上龍, MURAKAMI Haruki 村上春樹 or SHIMADA Masahiko 島田雅彦. 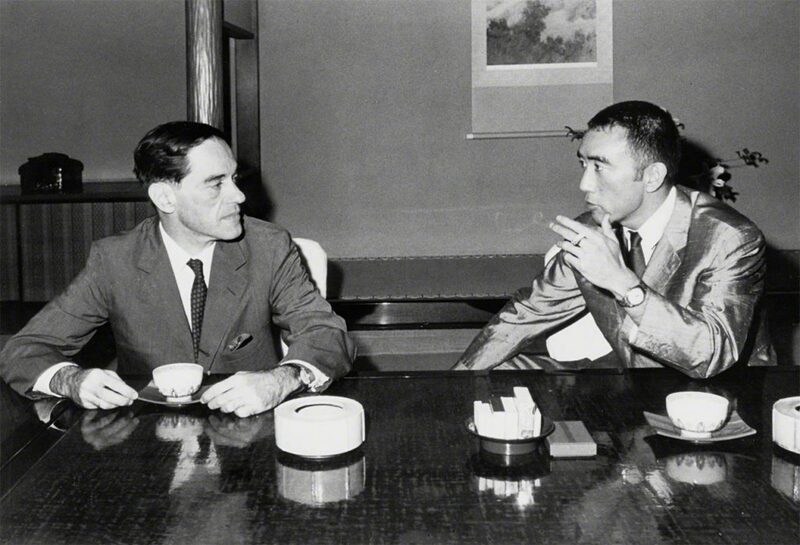 With profound interest I later read about Keene’s influence (involving betrayal of trust) on MISHIMA Yukio 三島由紀夫, who shockingly ‘lost’ against his early mentor KAWABATA Yasunari 川端康成 regarding the Nobel Prize in Literature. 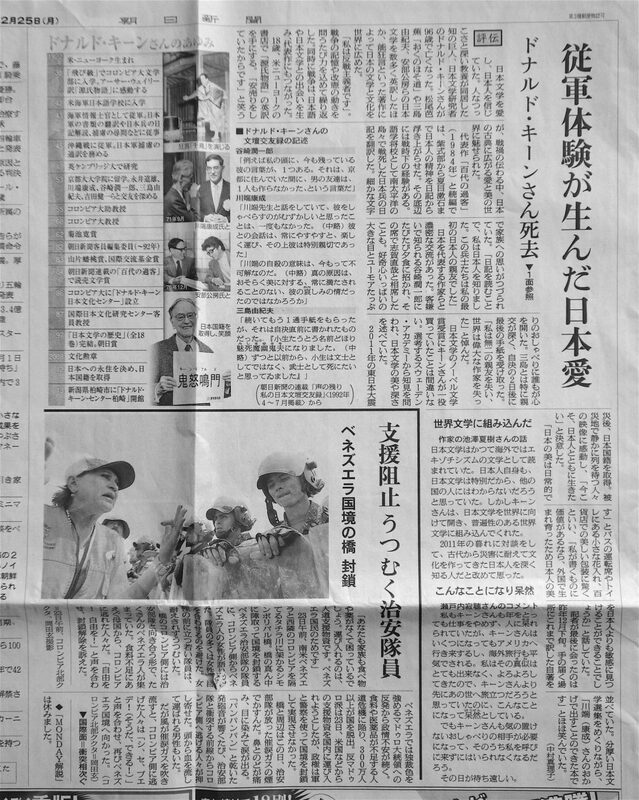 Today’s Literati at the public memorial probably remembered the crucial, ‘deadly’ relationship between Mishima and Keene as well. 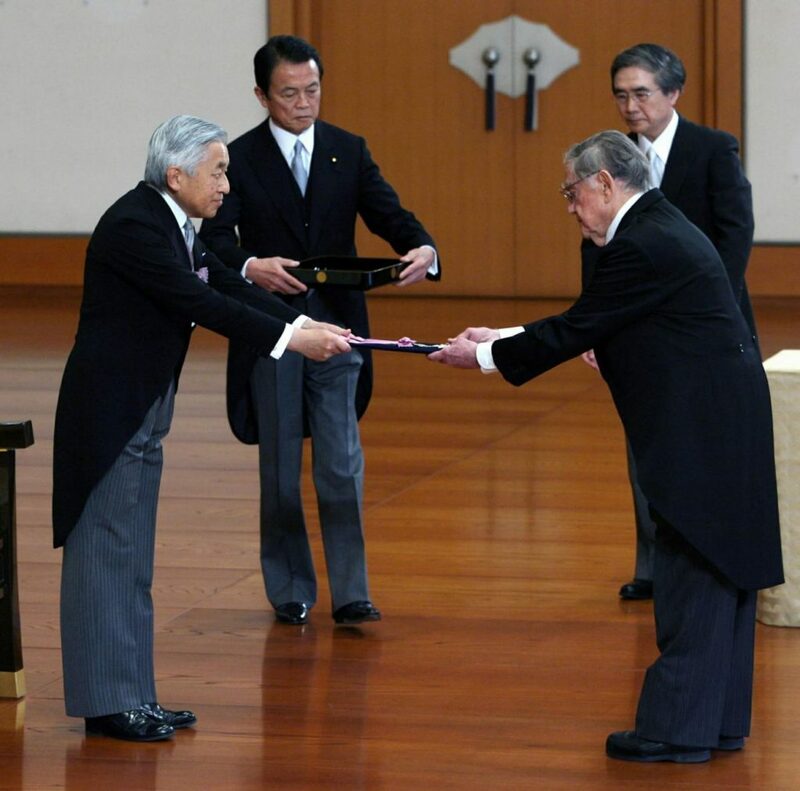 In 2008, Keene became the first foreigner to receive the Order of Culture 文化勲章受章 from the Japanese government, in recognition of his contribution to literature. 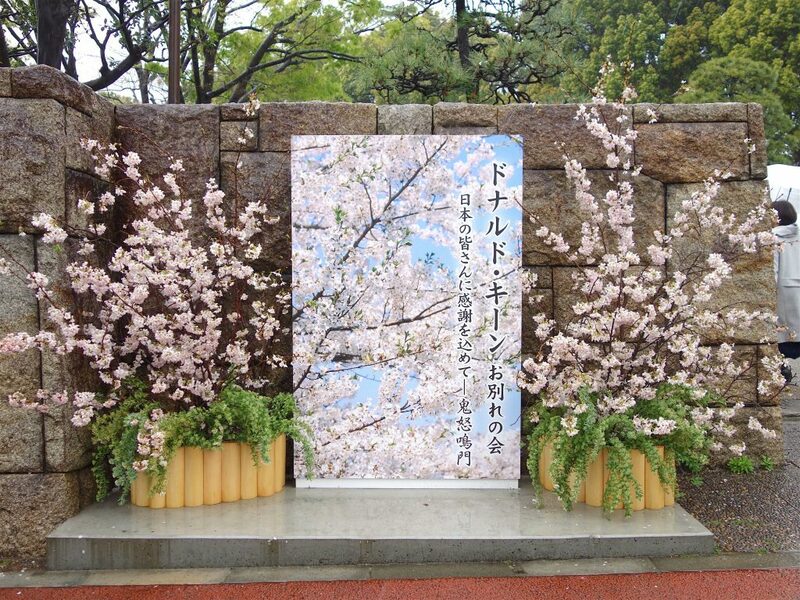 Therefore the envelope for condolence donation 祭粢料 (Saishiryo) by the Japanese Emperor (Tenno-heika) 天皇陛下. 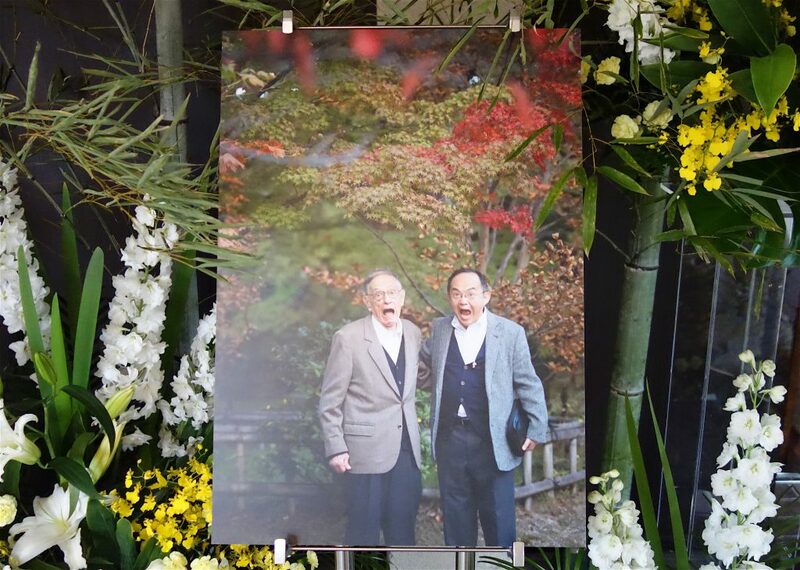 Keene became a Japanese citizen in 2012 after he moved to Tokyo, and adopted a Japanese man, Seiki Keene, as his son and heir in 2013, see the charming cover picture. 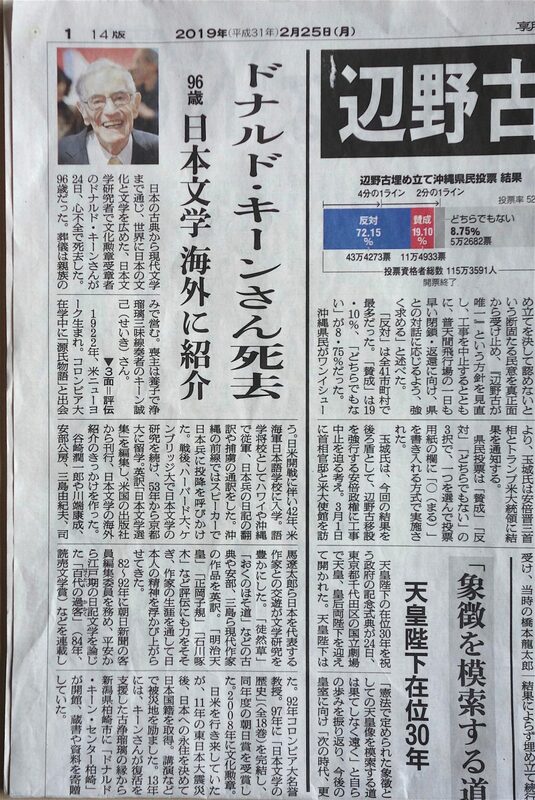 Dear KEENE Donald 鬼怒鳴門, I loved the Italian music which had been chosen for your funeral: “Vissi d’Arte”. 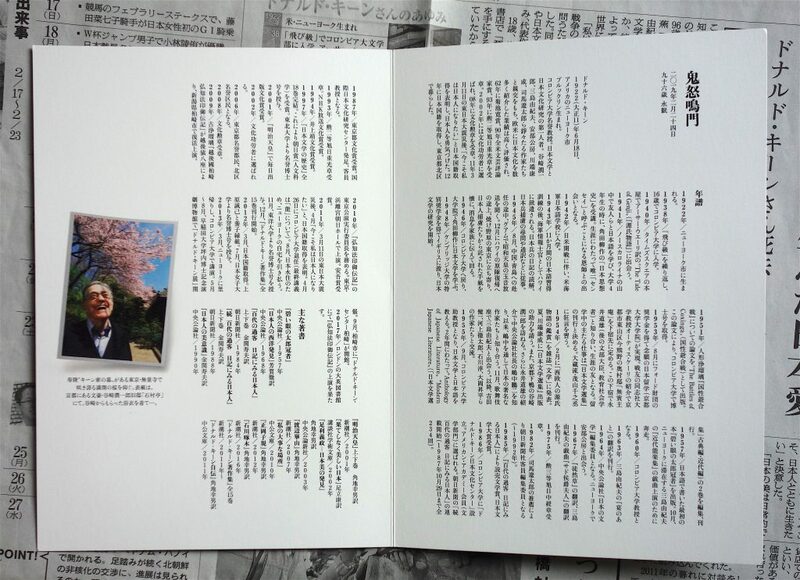 It supposed to be my music during my future funeral at ‘Aoyama Bochi’ 青山墓地. Riposa in Pace. The sexual neutrality Keene puts across in his writing about himself feels so deliberate that it backfires, drawing close attention to the very thing it excises. I have to assume, on his part, either complete asexuality or some variety of closetedness. 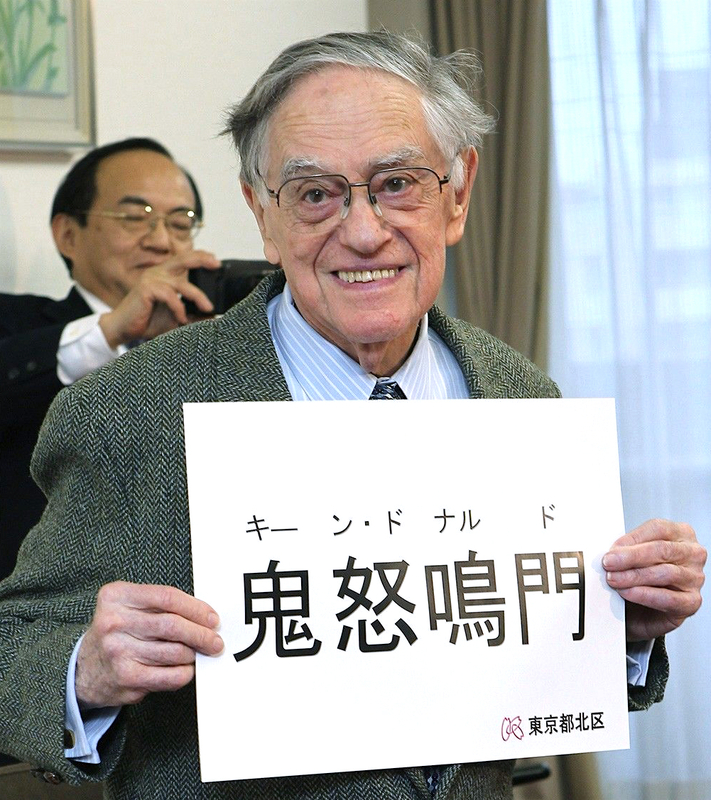 Certainly the latter is more plausible, especially given what Keene’s peer Donald Richie called “the strange prevalence of people of like preferences among foreign Japanese specialists” of their generation. Indeed, Keene’s contrast with the liberated Richie, who’s written at least one entire unpublished manuscript on his Japanese homosexual encounters alone, could hardly be starker.